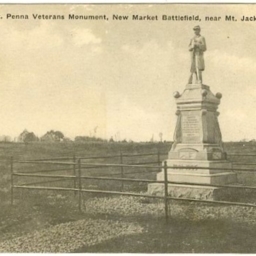 Postcard showing the Pennsylvania Monument on the New Market Battlefield. 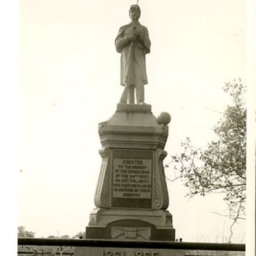 The monument is located just north of New Market Virginia and commemorated the 54 Pennsylvania Infantry Regiment. 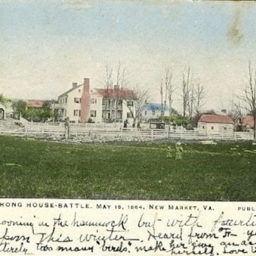 The card includes and description of their actions. 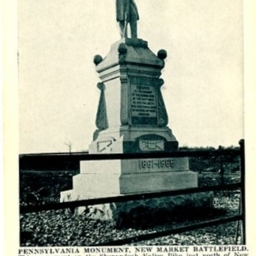 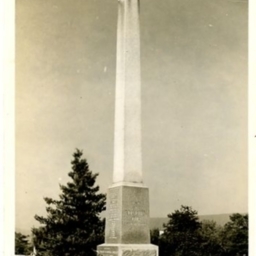 Postcard showing the Pennsylvania Monument at the New Market Battlefield. 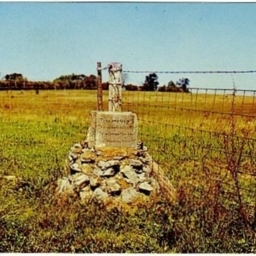 The marker commemorates the 54th Pennsylvania Infantry Regiment. 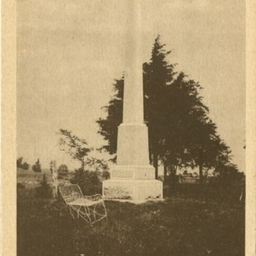 Postcard showing the 62nd Virginia's monument at the Battle of New Market. 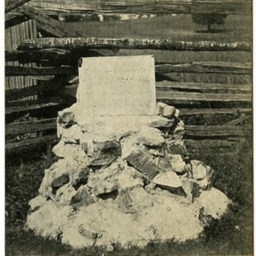 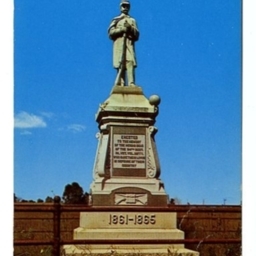 Postcard showing a monument that marks the spot where VMI Cadets participated at the Battle of New Market. 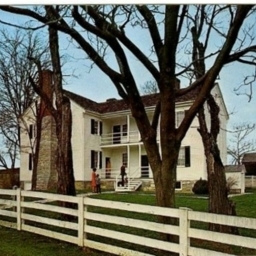 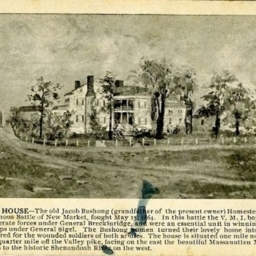 Postcard showing an aerial view of the Bushong house located on the New Market Battlefield. 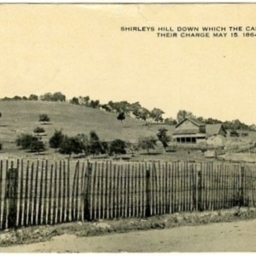 Postcard showing Shirley's Hill at the New Market Battlefield. 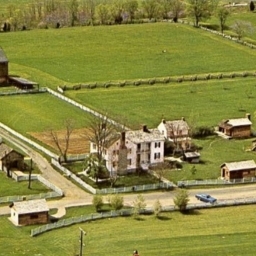 It was from this location that the Virginia Military Institute Cadets charged. 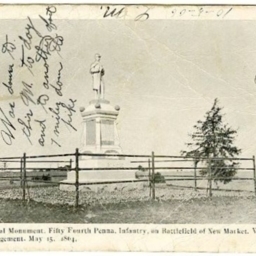 Postcard showing the "Federal Positions" on the site of the New Market Battlefield. 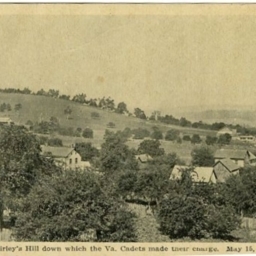 Postcard showing Shirley's Hill at the New Market Battlefield. 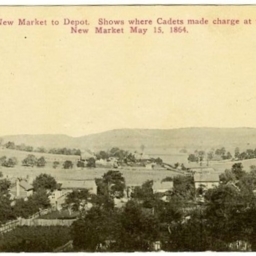 It was from this location that cadets from the Virginia Military Institute charged. 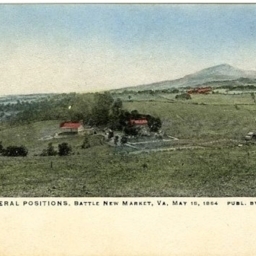 Postcard showing the New Market Battlefield and Massanutten Mountain in the background. 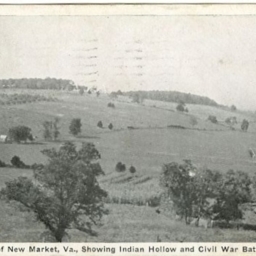 Postcard showing a view of the New Market battlefield. 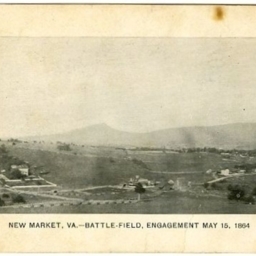 Postcard showing the the New Market Battlefield, part of the town of New Market Virginia, and the surrounding landscape. 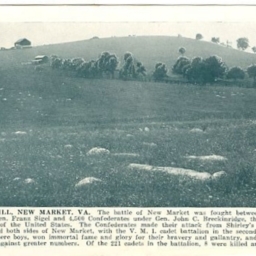 Postcard showing view of the town of New Market and the New Market Battlefield. 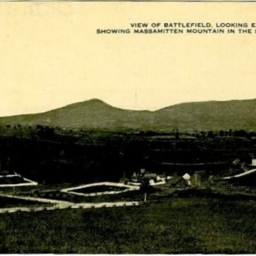 Postcard showing Shirley Hill on the New Market Battlefield. 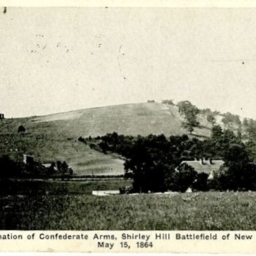 Postcard showing Shirley's Hill on the New Market Battlefield. 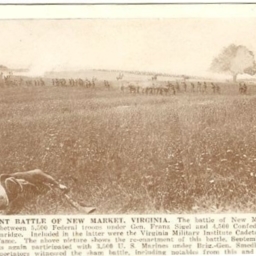 Includes a description of the battle.